The Tiger Ear Booth was definitely a once-in-a-lifetime event (that is, you only want to do it once). 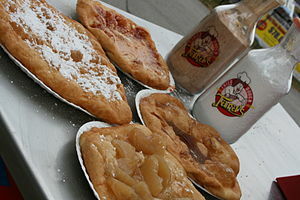 Both Nina and I spent the four hours shaking cinnamon-sugar on the Tiger Ears. About a half-hour before we were finished, I finally found a stool to sit on … but by then my feet were definitely done for the day. Tiger Ears are some kind of a scone with the dough squashed flat then fried in a deep-fat fryer, sprinkled liberally with cinnamon-sugar, and sold for $3.00 (extra honey-butter 50¢). The squishing process takes place in a hydraulic press with blobs of dough soaked in oil, then fried in oil. It is an oily, greasy process. By the time we were finished, I was in no mood to eat one! 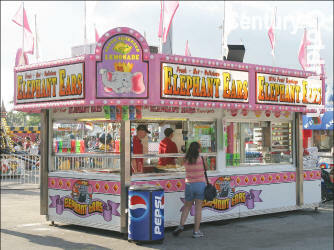 At the Utah State Fair, they call them Elephant Ears. I have never in my life been in “no mood to eat one.” In fact, the ONLY reason I went to the fair for the last seven years was to binge on the food there. The fire-roasted corn, funnel cakes, fried Twinkies, fried Oreos, elephant ears, huge corn dogs and anything else sold to me out of a little traveling food trailer. I didn’t go to pet the goats. I didn’t go to look at the booths. I went for the food.